With a little over a month until Christmas, you still have some time to make some of these quick and easy Christmas potholders. Use them yourself or give as hostess gifts or stocking stuffers. Each of the potholders in this project takes flannel fabric and quilt batting, plus any small decorations you’d like to add. 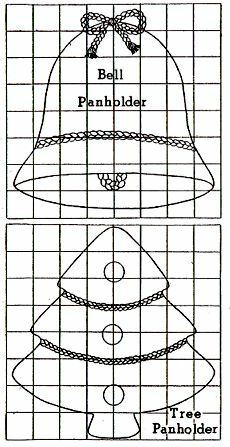 Enlarge the squares to 1″ squares and draw the outlines of the bell and tree. You can use graph paper, or if you have a photocopier available, enlarge the pictures until you have 1″ squares. Use red flannel or felt for the outside pieces; any kind of green fabric for the inner piece that shows at the bottom, and old cotton blanketing or quilt batting for the inner lining. Make two patterns — one including the entire bell, and the second pattern all around the top but cutting across the bottom on the line just above the clapper. Using the first pattern (the entire bell), make three layers, one each of red flannel, green fabric and cotton quilt batting. Using the second pattern make one layer of red flannel for the front, allowing 1/4″ extra at the lower edge to turn under. Fit this red front over the green piece, insert a braid loop between for a bell clapper and stitch two rows across. Now on this double piece place the first pattern and draw around the edge for a stitching guide. Put the cotton quilt batting layer under the green, and the other red flannel piece under the blanketing, and stitch all together, following the marked line on the front. Then trim evenly around the utside to within 1/8″ of the stitching. finish the edges with blanket stitching or binding. Sew the braid by hand across the bell in the position shown. Braid enough for a bow and fasten to the top. Cutting slightly larger than the outline, make three layers, one each of green felt (for the front); cotton batting for inner lining and red flannel or felt (for the back). ut the paper outline down on top or front (green) piece and trace around with a marking pencil to make a stitching line. Fit the layers together (green, then batting, then red) and stitch around the line just marked. Trim evenly around the outside to within 1/8″ of the stitching. Place two strands of braid across the tree in the positions shown and stitch down by hand. finish the edges of the panholder with blanket stitching or binding. Cut out circles from felt scraps of any bright colors and sew in the positions shown. Sew a bone ring to the top to hang. Again, enlarge the above design to 1 inch squares. Cut out the circle and the gingerbread man. Cutting slightly larger than the circle outline, make two layers of red flannel or felt (front and back) and one of cotton batting (inner lining). Put the paper outline down on the front piece and trace around to mark the stitching line. Fit the layers together and stitch around the line just marked. Trim evenly around the outside to within 1/8″ of the stitching. finish the edges with a blanket stitch or binding. Hand-stitch the braid around the edge, spacing the loops as shown. Let one extend up at the top for a hanger. Trace around the gingerbread man outline on brown felt and cut out. Embroider the eyes, nose and criss-cross buttons. Tack tiny rickrack across his middle for a belt. 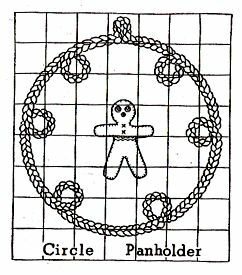 Whipstitch the gingerbread man to the center of the panholder. Trims by the yard and large-motif trims are great for use in making Christmas ornaments, greeting cards and gift items. A burlap wall hanging or a greeting card made out of construction paper can have candles of woven-braid trim, each topped by a flickering flame (a single notch from gold rickrack makes a perfect flame). Or a fireplace stocking can display felt animal decorations with face features and other portions formed by bits of trim. Stuffed animals, aprons, tree skirts, center pieces, and home decor items offer backgrounds for the creative use of trims. 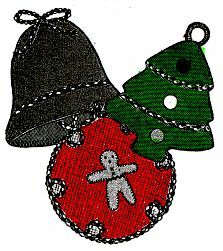 Ornaments in the shapes of stars, balls, bells (as shown above) and trees can be made from pieces of folded double-knit fabrics or felt. 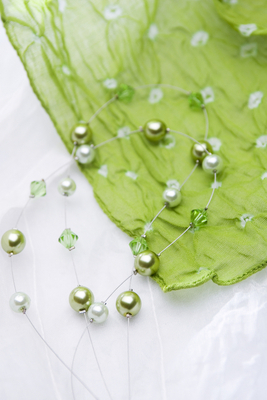 Decorate them with beads, braid or rickrack and attach a hanger for putting them on the Christmas tree. Spheres from ball fringe can become bunny tails, eyes or noses on faces, centers of flowers or entire flowers, spots on a giraffe, clappers on bells or the tassles on Santa hats. Fringe in layers makes any character’s hair or fur. In many tapered rows, fringe can become a tree; in a circle, a lion’s mane or a holiday wreath, and in a single row it can become a horse’s mane. Rickrack is the frosting trim on a gingerbread man, a cat’s whiskers, any creature’s mouth or raised eyebrows, a flower’s edge or a petal’s edge. When gathered in a circle, 8 notches become a violet while clusters of more notches become a marigold or rose. One rickrack notch is a nose; two notches make a feline’s claws. In addition, consider a very tiny folding screen trimmed with holiday motifs, or a small autograph book or small scrapbook decorated with holiday trims as gifts for someone. During the Christmas Season, imagination and originality never had it so good. And it seems that one trim leads to another. Once you get started with the trims, ideas for additional uses just seem to pop out of nowhere! Dig into your scraps and trims and get started early, so you’ll have time to get everything finished. 1) Do take photographs in good lighting. Lighting plays a tremendous role in photography. When possible, avoid taking photos under shadows and direct sunlight. Natural, filtered light is always a good option, such as sunlight passing through a window. If you can afford to do so, purchase a proper light box (or create one!) that uses daylight bulbs so that your photographs can appear more professional. Keep your photographs simple. If you’re using props, make sure it relates to your product. Take a good look at your background and ensure that it doesn’t take the spotlight away from your jewelry. 3) Do use your camera’s macro setting. When customers shop for jewelry online, they want to be able to see every single detail since they can’t see touch it or even turn it over. With jewelry photography, the macro setting on your camera is your friend. This option allows you to take crisp, close-up shots. 4) Don’t use your first photo. Don’t settle for the first (or even second) photo you take of your products. Take your time and experiment with different angles, backgrounds and lighting. It pays to have more options later on! 5) Do stick to a look that works. If you want to keep things clean and professional, then it’s best to stick to just one look and style when taking photographs of your jewelry. Experiment to your heart’s content—but once you figure out a look that best complements your products, then stick to it. 6) Don’t upload your photos without editing them. Always make it a point to edit your photos before uploading them online. Crop your photos, resize them, and tweak anything that may need tweaking. There are so many programs out there that make editing photos really simple! You’ve already created beautiful jewelry—now do your labor of love some justice and take good photographs of your pieces for all to see! At this special time of year you can make your family and friends VERY happy if you give a practical gift that they can enjoy throughout the year. Think about each person’s “likes”, hobbies and even things that you know they would really enjoy but wouldn’t buy for themselves. I always try to get my gift giving list out early so I have enough time to figure out what each person would like to have, then be able to order the gift or make the gift in order to have it just in time for the big day. If your friend/relative is a frugal type of person and you know they make a habit of using coupons each time they go to the store, you would be doing them a big favor by getting them a beautiful Coupon Clutch to hold their coupon collection. The coupon clutch fabric binder cover comes in many different designs, and makes a 3-ring binder look like a designer purse. Throughout the years these coupon clutch binder covers have been one of our most popular Christmas gift items. Another great idea for all of your sewing and crafting friends would be a sewing machine repair book — your friend or relative will thank you over and over again as she is able to use this book to do her own repairs on her sewing machine and keep it out of the repair shop. If the gift recipient is someone who is looking for a way to make a little extra money, you might want to consider the Sewing Machine Repair as a Home Business manual for that person. You still have plenty of time to be making gifts for those on your list, and I’d recommend that you check out Patterns2Go for dozens of sewing, crafting, crochet and knitting projects you can easily make. 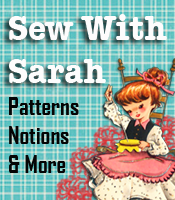 These patterns are all downloadable so you don’t even have to wait for the pattern to come in the mail or use any gas to run to a fabric store to browse through pattern books. Practical gifts are always a great gift – and one that is appreciated for many days and months after the Holiday has come and gone.